Les Kossatz is a Melbourne artist and sculptor and a descendant of a wendish family. His Exhibition “The Art of Existence” was on display from 22 Nov 2008 to 8 March 2009 at Heide Museum of Modern Art, 7 Templestowe Road, Bulleen. The Age Newspaper on Saturday 22 November noted on page 17 in the A2 section that his “forebears” were “Wendish farmers from East Germany”. At a German Fest at Tarrington/Hochkirch back in the early 1990s, some of his back-packs were featured in the Tarrington Lutheran Hall. These were loaded with luxuries from West Berlin, which, in the artist’s mind, were being transported back to Eastern Berlin after the fall of the Berlin Wall. The present display includes about 100 of his works and a large book titled “Les Kossatz: The Art of Existence” is available for $120. I paged through it and noted with interest his gradual developing stages of artistic achievement since the early 1960s. Di Gribbles (nee Glenn) the book publisher and partner of Les, has provided a useful chronology and various eminent artists and scholars like Patrick McCaughy have contributed sections. This would be good addition to our library, as an example of a famous contemporary, very artistic Wendish descendant. Les grew up at St Andrews just north of Melbourne and has been a lecturer at the RMIT School of Art and at the Monash Uni School of Art. Back in the 1960s, Les experimented with different sorts of materials and techniques and behind his work was a deep “interest in the tensions between the natural world and the conventions of society”. During the 1970s, this tension developed into a deep concern over the “human desecration of the Australian landscape”. His “Opening Ground Country Grass 1970” contains a deep crack in the land and his “Forgotten Landscape 1972” sadly includes just the decapitated heads of some native animals, reminding viewers that Australia’s unspoiled nature is now mythical. By 1972, he was also sculpting sheep from cast components and wool. His interest in sheep was inspired by his experience of nursing an injured sheep at his farm at St Andrews. The sheep for Les operated at two levels or extremes: a sheep was representative of the passive, animistic spirit of the land but it also stood for the “squattocracy” and conquest of the land, so clearly depicted by Les in his “Squatter: Ram in a Chair 1983”. 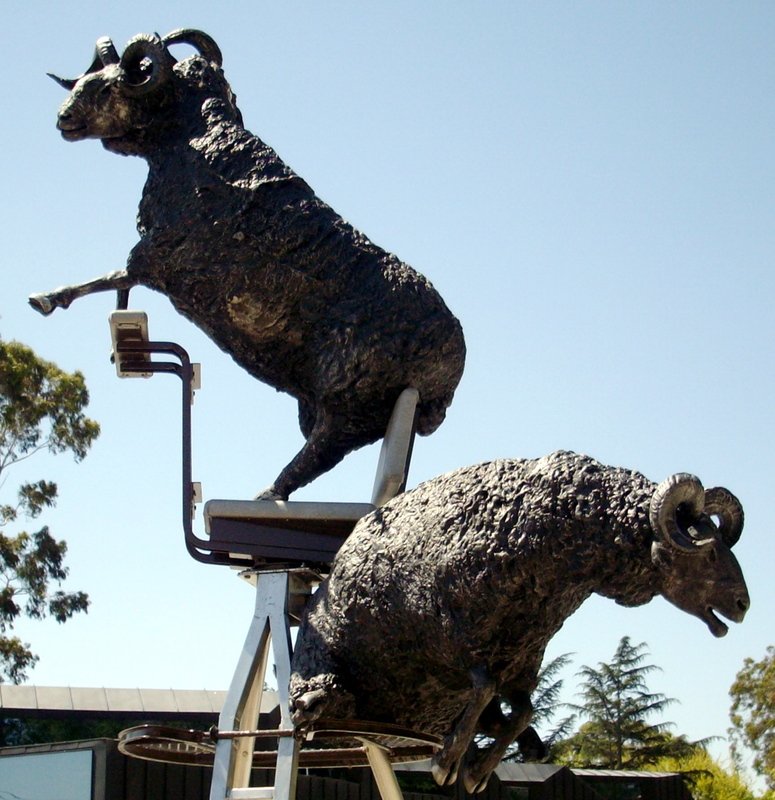 With head back and feet up, the ram clearly depicts the squatter’s tempting of fate with its arrogant behavior towards man, animal and authority. The “Am Zoo Berlin” series in the 1990s clearly depict the quest by “East Germans” for consumer goods as a consequence of the collapse of the Berlin Wall. The Kakadu paintings take up again the tension between the landscape and the human compulsion to control natural resources. Les depicts this by including technical charts and computer diagrams on his landscapes. His Postcards on Religion conclude the display with some thoughts from world religions and challenges to the exclusive claims made by some of these. He observes that “Christianity became implicated in the world which it sought to save” and that it continually changes. He informs us that “in Palestine its concern was Fellowship; in Greece it was Philosophy; in Italy it was Institutions and in Europe it became the culture. In America it became an Enterprise”. No wonder the book “Les Kossatz: The Art of Existence” includes on page 179 an exploration of the issue: “Is art reality? Is reality art?” Perhaps the title “The Art of Existence” says it all. You can’t have one without the other! On Sunday 11 January at 2pm, Les Kossatz discussed his art with Guest Curator Zara Stanhope at Heide Museum. Some of our Society members attended this discussion. On Sunday 1 March from 10.30am to 12noon, Les showed visitors through his studio in Carlton, where he has worked for the past 30 years in the old “Golden Glory Clothing Company” building. The admission was $18 and booking was through Heide Museum of Modern Art, 7 Templestowe Road, Bulleen Vic 3105; Tel (03) 9850 1500.